This entry was posted on March 7, 2017 by Nick. 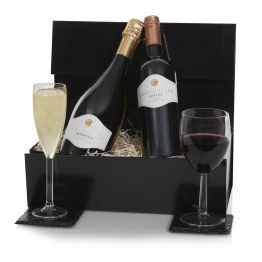 Hamper.com has a fantastic collection of wine hampers that are perfect for a range of occasions, including Mother’s Day, birthdays and more. Our experts choose vintages from some of the most renowned winemakers in the world to go into our luxury hampers. Some of the luxury wine hampers that we provide are accompanied by a range of tasty delicacies including indulgent cheeses, smoked meats and sweet treats. Whether you’re looking for a hamper for a loved one or a business client, Hamper.com can help. 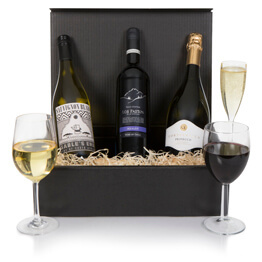 Containing something to satisfy all tastes, the Three Bottle Mixed Wines hamper features bottles of Australian red and white, as well as an Italian Prosecco. The wines are from Rosemount Estate and whist the red is bold and fruity, the white is soft with a hint of citrus. Whatever the occasion, this wine hamper is perfect for celebrating! 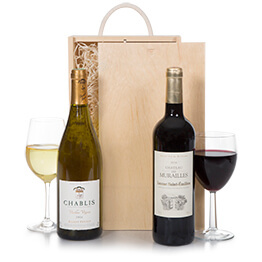 This gift is perfect for wine lovers, particularly if they are something of a connoisseur! The Luxury French Wine Selection features two classic bottles of exquisite wine. The red is a Chateauneuf du Pape and has notes of spices and fruits whilst the white is a classic Chablis which has good length and body thanks to barrel ageing. 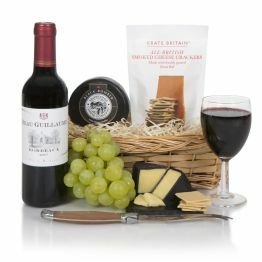 The Wine, Cheese & Pate hamper is a popular choice thanks to the distinctive combinations of flavour on offer. 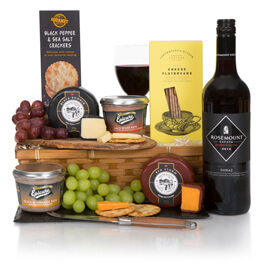 The bold Rosemount Shiraz is complemented perfectly by the Black Bomber and Wensleydale cheeses and the duck and pheasant paté. A fantastic gift for a business associate, the Connoisseur Six Bottle Selection features two whites, three reds and a bottle of Champagne. 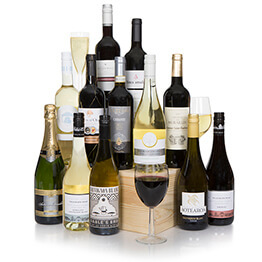 Experience a range of flavours and tastes in this fantastic luxury wine hamper. 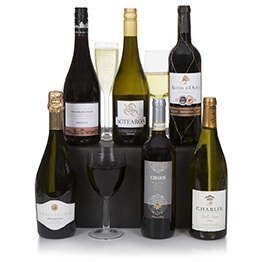 The ultimate wine gift from Hamper.com, the Grand Twelve Wine Selection features a wonderful range of premium wines from vineyards around the world. 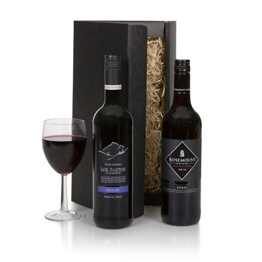 From Australian Shiraz to South African Merlot, this wine hamper has something for everyone. If you would like more information on the next day gift hampers that we provide, then please get in touch. Contact us online and a member of our team will get back to you as soon as possible. Alternatively, call Hamper.com directly on 01235 833732 if you have any questions. Hamper.com lets me send a lovely gift to my daughter in the UK. The company is reliable and she always enjoys the contents.